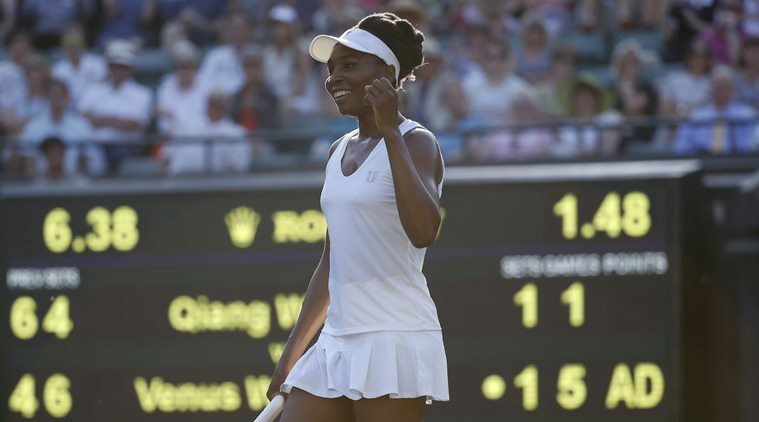 Five-time winner Venus Williams rolled back the years with a vintage display as she beat French Open winner Jelena Ostapenko in straight sets under the Center Court roof to reach the semi-finals of the Wimbledon Championships. Williams, 37, became the oldest woman to secure a place in the last four of the tournament since Martina Navratilova in 1994 with an impressive 6-3, 7-5 victory over the Latvian at the All England Lawn Tennis Club. Spaniard Garbiñe Muguruza, runner-up in 2015 and winner of the 2016 French Open, is also through as she swept aside seventh seed Svetlana Kuznetsova of Russia. American veteran Williams has not won a Grand Slam since clinching the Wimbledon title back in 2008 but appears to be returning to her best form. Ostapenko, who stunned the world with her victory at Roland Garros in Paris last month, was considered a formidable opponent for Williams but the American proved too strong, wrapping up victory in an hour and 13 minutes. “I feel quite capable, to be honest, and powerful,” said Williams. Williams will face either Britain’s Johanna Konta, who beat Romanian second seed Simona Halep 6-7, 7-6, 6-4 to the delight of the Center Court crowd, in the semifinals on Thursday (July 13). Muguruza also impressed in her win over Kuznetsova, a four-time Wimbledon quarterfinalist, and will go up against Magdaléna Rybáriková of Slovakia. Vandeweghe had been touted as a potential winner after a string of impressive wins but was no match for the Slovakian, who eased to a 6-3, 6-3 win. Men’s world number four Novak Djokovic sealed his place in the last eight of the men’s event with victory over Frenchman Adrien Mannarino. In a match which could not be played yesterday due to the five-set marathon between Rafael Nadal and Gilles Muller, Djokovic shrugged off shoulder injury concerns to progress with a 6-2, 7-6, 6-4 win. The Serbian, whose Grand Slam collection of 12 titles includes three won at Wimbledon, will take on 2010 finalist Tomáš Berdych of the Czech Republic tomorrow.